Yesterday at Chautauqua, Ellen told me that the day before Kate had pointed to a place on Bestor Plaza and said that it was a nice shop and that she had bought things there before. Ellen and Gordon’s sister, Ann, went there and discovered that it was someone’s house. I observed a number of things that Kate told people during the week that I knew were not correct. They were all minor things. In such cases, I don’t say anything. It would only make Kate feel bad, and it wouldn’t make any difference to the listener. I wish I always exercised good judgment, but I find that when it is just the two of us I seem to be more prone to correct her. After the morning lecture yesterday, Kate was hungry. I got her a melon tart to tide her over until we got to lunch. I took her to a bench outside The Amp and told her to sit there while I took our cushions back to the room. When I returned, she was gone. I looked all over. When I saw Ellen and Ann, I told them to go to Hurlbut Church, and we would meet them. Ellen called to say that Kate was at the church already. I was relieved, but the frightening thing is that she had forgotten in the short time that I was coming back for her. When I reached her at the church, I didn’t say anything. We arrived at Chautauqua last evening just in time to walk to The Amphitheater for the night’s entertainment. A Swedish group performed the music of ABBA whose music was featured in the movie and stage production of Mamma Mia. We enjoyed it, Kate especially. I told her I had never seen her express the same degree of enthusiasm for the Knoxville Symphony. We got to bed later than usual because the performance wasn’t over until nearly 10:00. This was three nights in a row. It was hard for Kate to get up. It was 9:00 before she got to breakfast. After breakfast, she went back up to the room to rest some more. I have noticed that over the past year or so she has been sleeping more. Usually that involves going to bed as early as 8:00; so the change in the schedule really affects her. It has been a good day here. She has enjoyed herself but has been hot and is resting in bed right now. We had lunch with friends from Long Island and ended up spending most of the afternoon with them. I noticed that Kate gives some misinformation or fails to pick up on things in our conversations. I know this is one of those things that will only get worse. This morning we leave Niagara-on-the-Lake for Chautauqua after a very pleasant 2-day stay. Everything had gone beautifully until last evening as we were preparing to go to dinner and a play. Here’s the story. First, we had a big breakfast at our B&B finishing close to 10:00. When we came back to the room, Kate got back in the bed to rest a little while. She got up for us to meet Ellen Seacrest and her sister-in-law, Ann, for lunch at 12:15. That meant we ate lunch before our stomachs were ready for more food. After lunch, we. Went to a play at 2:00. When we got out after 4:00, we got ice cream. Then we came back to the room for Kate to rest a while before our dinner reservations at 6:30. She was stuffed and didn’t feel like eating, but we needed to eat before the play at 8:00. As she was trying to find something to wear, I got up from my chair and my phone fell on the wooden floor. The noise frightened her, and she said something like, “Don’t do that.” I said, “I didn’t mean to do it.” Then she immediately broke down into tears and heavy breathing as if she were having what I call a panic attack. She told me she knew I would never scare her on purpose. She couldn’t stop crying and continued to breathe heavily. I tried to calm her down by putting my arms around her and holding her, but that didn’t seem to help. She went into the bathroom to put on her lipstick. I followed her and rubbed her back and started playing some soft music on my phone. As she continued to cry, she said, “my mind is going. The medicine is not working.” I held her tightly. She lay back down in to calm herself. She must have cried a total of 15 minutes. This was the biggest breakdown she has had. For me this was a sign that she hasn’t deteriorated so much that she is unaware of her decline. I was moved by the anguish she expressed and couldn’t help thinking about how much of this she carries with her all the time without my being aware. If I can’t fully grasp the extent of her suffering, how could anyone else do so? After she had calmed down and we prepared to leave, she commented that she was all right now, that she has just broken down. She went on to say that she thought that she normally is able to control herself better. Moments like this reinforce my efforts to avoid making her feel “not good” to quote a friend of mine. This is his advice for everyone in all situations. 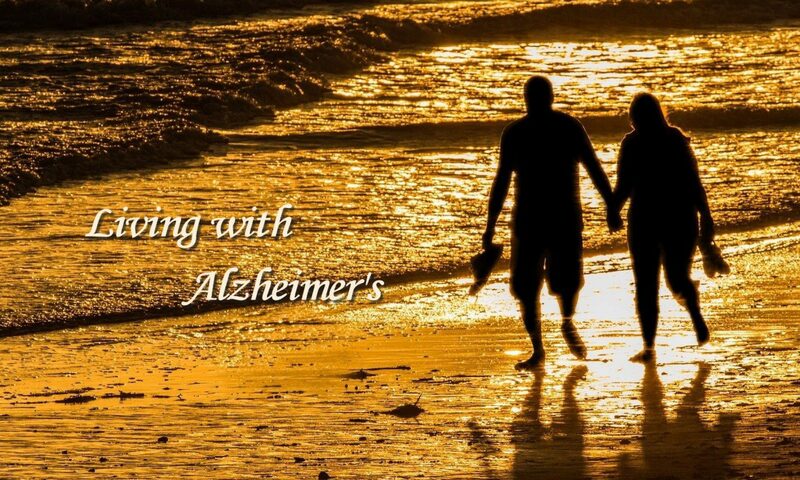 That is a special problem to avoid with Kate and, I believe, with other Alzheimer’s patients. Today is my 74th birthday. It looks like a day of getting ready for the trip to Chautauqua. We leave Thursday morning. Kate appears to have forgotten that it is my birthday. I will think of some way to let her know without making her feel bad that she has forgotten. I may remind her that we are planning to go to a movie as part of our celebration. I told her we would also look for clothes she might need at Chautauqua. On the way back from Nashville yesterday afternoon, I asked what she would think if we took Jesse and the twins along with Kevin and Taylor to New York next summer. She liked the idea. Yesterday was a good day for everyone. Taylor slept until after 10:00 am, and Kate worked in the yard most of the morning. I read the paper, caught up on email, and wrote an entry in this journal. Taylor and I played in the pool for about an hour. We had lunch at Panera’s and got ice cream at Marble Slab afterwards. We came back home where Kate and Taylor worked puzzles for a while before we went back in the pool until time for dinner. We came home and watched the Spurs beat the Heat to win the NBA championship for the second time in a row. Last year we watched the final game in Jackson Hole where we celebrated our 50th anniversary. Kate did not say anything about its being Father’s Day, but she did realize when Jesse called, and later we talked with Kevin. As we drove back from dinner, she said, “I hope you’ve had a nice birthday.” I told her that I get to celebrate twice this week, today for Father’s Day and Tuesday for my birthday. I am not sure she understood. When we got into bed last night, she said, “Happy Birthday.” The only sadness I feel about her is that it is another sign of her continuing deterioration. A couple of other things are illustrative of her condition. She asked me several times yesterday what time we would leave for Charlotte today (to take Taylor to the airport). I wouldn’t be surprised if she doesn’t ask again this morning. As we were about to leave Panera’s yesterday, she asked if we could drive home the other way to show Taylor. I told her we could. After we had gone a short way, Taylor said, “How far is it?” She said it was not far, just a little bit farther than the usual way. (I watched the odometer and noticed that it is 2 miles farther.) When we passed Panera’s, Taylor asked, “Did we just go in a circle?” Kate answered, “Well, . . . you might say that.” Then she asked me if that is correct. I told her it was. What was interesting was that Taylor at age 11 very quickly observed that we just went in a circle, but she had not and had to check with me to confirm it. I continue to be pleased that she enjoys the grandchildren so much and will definitely be thinking about some kind of plans for us to get together over the next year and next summer. Our yard is looking better all the time. This is another thing from which she can derive satisfaction. I love it because it gives her something productive to do, and I love the beauty she has created. She doesn’t always do things the way I would (if I did them at all), but overall she makes the yard look more beautiful. That makes both of us happy. Now that the twins have gone we are down to one grandson, but the fun continues. Kate has always, and continues, to enjoy being around the grandchildren. This year is no different. We had a good day with Taylor yesterday. We swam in the morning, went to Chick-fil-A for lunch, saw a movie, had ice cream at Marble Slab, came back home for another swim, went to dinner, and topped off the day with a game of Battle which he won. The enjoyment that Kate has gotten from the grandchildren is making me think more seriously of planning something for next summer even if we don’t have them one at a time. The reason I am not considering having them one at a time is that I am not sure that I can handle both Kate and the grandchildren. On the other hand, if she is still as easy to care for as she is now, we could do it another summer. We loved the movie yesterday. At least I did. Taylor said he thought it was interesting. Kate wasn’t taken with it at all. It was Million Dollar Arm. It is about a sports agent who brings a couple of guys from India to the US to learn how to pitch. It is based on a true story, but Kate did not realize it until the end when they showed the real people. I had read her the description of the movie before going, but not surprisingly she didn’t get the part about the “true” part. I never thought to emphasize that to her. In fact, I didn’t think of that as a critical part. It was just a good story. This is the kind of thing that happens every day. I try to prepare her for things, but I just can’t anticipate what is going on in her mind. Nevertheless, I always try to think what I could have done to avoid confusion. It is similar to her panic when she couldn’t find me at Great Wolf the other day. I never thought she would be confused about my whereabouts, or I would have clearly told her I was going with the grandchildren and would be back. I thought she heard the conversation and saw me leave. It is a sign that she is not even listening much of the time. It must be such a strain trying to follow everything that is said and going on. She just tunes out. Jesse and the twins arrived from Mt. Pleasant on Wednesday, June 11. The next day we all went to Nashville where we spent the night at Wilderness at the Smokies, an indoor water park. It was a great time for all. The boys, as usual, got along quite well, and they loved all the things to do involving water. Kate was especially getting to watch her three grandsons having such a wonderful time. I did not get to talk extensively with Jesse regarding her impressions of Kate. This would be the first time she has been with Kate since I informed her of Kate’s Alzheimer’s earlier this year. A couple of things happened that illustrate how she is doing at this time. First of all, the first night Jesse was with us in Knoxville she had been playing Battle with the boys when she asked me to take her hand while she went to the bathroom. She never came back. When I checked on her, she had gone to bed. She told me she was all right, just tired. I feel sure that in the past she would have excused herself and said good night. At Wilderness the first day, we were all together when the 3 boys and I went to ride a raft that runs through a long tube. In retrospect I believe she didn’t realize what we were doing. When I got back, Jesse told me she was walking around. I went to where Jesse said she was. When I reached her, she was in a mild panic. She didn’t know where I was and had been looking all over for me. This is another example of her being so normal in many respects that I treat her as normal. I should have made it clear where I was going and that I would come back to her when we finished. The next day (yesterday) Jesse, Kate and I had left the table at which we had been sitting to watch the twins on one of the water attractions. After a while, Kate started to ask me if I would get her cup of water from our table. Then she said she would do it. I let her do so although I was concerned that she might not remember where it was. After a few minutes I started walking to the table when I saw that she was walking back in our direction without the cup. I offered to get the cup for her. Despite incidents like these, I am still encouraged that she and I are able to enjoy these times together and that the problems so far are ones that don’t significantly diminish the joy we have always had. At the same time, I am not naïve to the fact that the time is coming when the problems will come to be a bigger issue for us. Looking ahead I can’t help wondering about next summer when it would be the twins turn to travel to New York with us. I have already decided that if we make the trip at all, I will want Jesse to join us. Seeing Ron and Randy with Taylor this week has raised another possibility. Taylor would be scheduled to make the NYC trip the following summer (2016). Because I am doubtful about Kate’s condition at that time, I think it might be good to take the three of them to NYC, with Jesse, of course, and perhaps with Rachel or Kevin. I intend to broach this subject with Jesse soon. I may also bring it up to Kevin. Yesterday I commented on what I usually term Kate’s growing childlike condition. A better way of describing much of her behavior is to say she seems to have lowered her inhibitions. So far this has not presented a problem, but I can see that it might do so in the future. Here are two examples. On Sunday while we were seated on the front row at our combined adult Sunday school class, she was quite tickled at the performances of two of our associate pastors who were reading and acting out the parts of devils in C. S. Lewis’s The Screwtape Letters. Her laughter was quite audible but never a problem. Once again, however, this has not been characteristic of her in the past. The second example occurred last night at a reception for the symphony. The MC was introducing a number of people to congratulate for their contributions in making for another successful season. When he got to our Executive Director Kate yelled out “Go, Peggy.” This response was not loud enough to be noticed by more than a few immediately around us, but, once again, this is not normal behavior for her. Besides that she is not close to Peggy at all. On another front this morning we had another example of her memory’s failing. Today we are going to Nashville to pick up our youngest grandchild, Taylor. Around 7:30, I told her that we would leave around 9:30. About an hour later, I noted that we had not discussed where Taylor would sleep and that he had slept in her office the last time he was here. She said she would clean up the office so that he could do so again. I noticed a short time later that she was in her office cleaning up. Then I went to get gas in the car and to buy iced tea and lemonade from Chick-fil-A. When I returned at 8:40, she was outside pruning shrubbery along the driveway. I stopped and reminded her we would be leaving in about 45 minutes. She asked where we were going. I told her, “To pick up Taylor in Nashville.” She said, “Oh, yeah.” Then she told me she wanted to stay out another 30 minutes before coming in to get ready. When I came inside and went to her office, I noticed that she had not cleaned it up. It is an absolute mess. Fortunately, we don’t have to leave as early as I had planned. We can leave an hour later and still have time for lunch and to get to the airport on time. I simply report this incident as another illustration of what things are like. One other thing I should mention is that although Kate seems less worried or bothered by her condition, there are some situations that do frustrate her. One of those occurred as we were getting ready for last night’s reception. I had noticed that although I had bought her new clothes early in the spring, she has not been wearing them. She asked me where they were, and I told her they were in the front of the closet. When I went to get them, I noticed that there were only 2 of 5 pants there and a couple of tops. She could tell I was frustrated over their not being there and said tearfully, “I just can’t do anything right.” She is pretty much correct about this. And this occurs during a period of time when she is so desirous of being able to do things for herself. This is the first time in a while that I have heard her express such a sentiment. It serves to remind me that the person with Alzheimers knows she is failing and finds it frustrating and no doubt frightening. This current struggle for a way to retain her independence is illustrated by her wanting a calendar for the refrigerator. That is something she mentioned to me several times before we got it at Staples over the weekend. It seems to me a desperate attempt to regain control of her life. And, of course, she and I know it is a losing battle. What a tragedy this is. Among the subtle changes that have and are taking place with Kate are the various behaviors that I call “childlike.” These are so subtle that I doubt that anyone else would even notice if they occurred in their presence. One of those that I can’t describe is a look of detachment like the innocence of a child. These often occur when she gets some kind of soil on her clothing or spills something on a piece of furniture or the floor or loses an earring. It is as though it simply doesn’t matter or that she doesn’t realize how significant it can be. One of those involves some jade jewelry that she bought in New Zealand. I haven’t seen them since shortly after our return home. She wore one of the necklaces several times and then couldn’t find it. By now she has forgotten she has them. I suspect they are in her room somewhere but neither of us would know where. Another example would be her “little game” of counting the number of people who are walking along the sidewalk or crossing the street. As we drive, I will hear her say, “One.” Then she will say, “Three.” She often counts the cars at an adult video store. Over the weekend, she said she was going to start counting the times we pass McDonald’s when there are no cars at the drive through. The first time I ever noticed anything like this was when she started announcing the price of gas at the various gas stations we passed. I think this came after some mention about my being observant. She made a deliberate effort to be more observant herself. I have mentioned before that she gets more irritated with me than she has ever been in our married life. When she is irritated, however, she is not really nasty. She seems more like a little child. Another thing I notice is that she delights in joking with me, something that she has never done before. The downside of all this is that it occurs because of deterioration in her brain. The part of her brain that controls her actions is weakening, and she is allowing herself to express herself in ways that she didn’t use to do. I have mentioned before that she is less attentive to the way she dresses and the way her hair looks. She usually does not brush her hair before we go out. I do this for her, and she is appreciative not annoyed that I am taking over this aspect of her life. On the other hand, she is annoyed by my helping in other ways. She asked me over the weekend to let her respond to people before I do. She said this as a reaction to my answering emails or making phone calls to people who had contacted both of us. I have done this because she doesn’t feel the need to respond right away, and then she forgets about doing it at all.